The trip to see the Himalayas during the recent trip to Nepal was a roller-coaster of emotions. The initial excitement and enthusiasm gave way to feelings of nagging doubt about the safety standards of Yeti Airlines, a name none of us had heard of. A story narrated by a colleague during drinks the evening prior to the flight about a plane crash doing the Himalayan route was hardly helpful! We reach the Kathmandu airport early in the morning for our flight. And then we are handed over the boarding pass for Yeti Airlines’ flight OY-302. The pass says in big and bold, Destination: “MOUNTAIN”! I thought we had paid for the return trip to Kathmandu from the mountains. That does it! In a crazy moment I even wonder which mountain was destined for each one of us by the Yeti. We are also handed over a small brochure highlighting how safe the aircraft was and this brochure also has a visual depiction of what we are going to see on our trip, peaks labeled with their Nepalese names with the height of each. We are driven in a coach to the tarmac, 45 minutes behind schedule, to our aircraft. 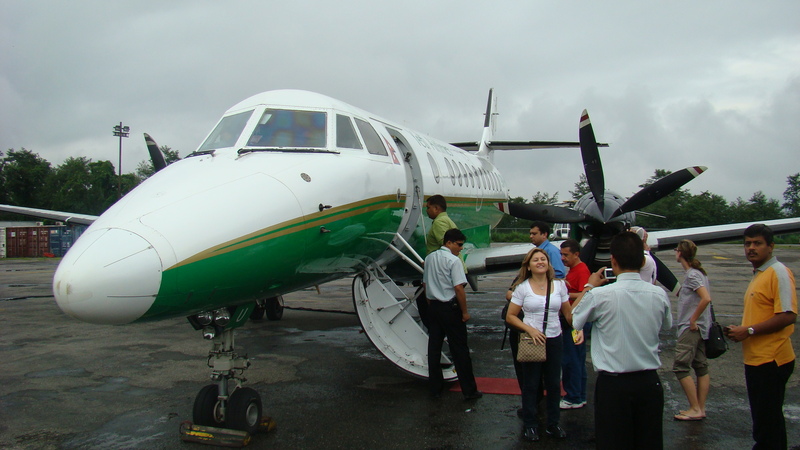 This is a Jetstream-41 which, I discover from the brochure, is a state-of-art British Aerospace built machine. Looks good, I think to myself as I step on to the aircraft. The seating configuration is 1+2 but the seating is 1+1. The aisle seats have no occupants and hence each one of us has a window seat to ourselves. Reasonably generous-sized windows with a reasonably clear vision. The air hostess dressed in a traditional Nepalese uniform serves us some cotton wool and Yeti lozenges and we are set to take-off. A very smooth take-off I think to myself as I gaze outside taking-in the lay of the Kathmandu suburbs and then the view changes quickly to the countryside. Then the moment where we climb above the clouds on our way to the “Mountains”. The aircraft in its cruise mode stabilizes at around 23,000 feet. In the distant horizon I can see a cluster of mountains, all hazy through the clouds. I hear cameras go click-click, I pull out mine as well. Just a mad series of clicks trying to capture all what I see. Clouds are now playing the spoil sport, appearing in thick white cotton-wool like piles and then disappearing again. And then the peaks appear, one by one, looking just as they have been depicted in the brochure. How could that be, I wonder. The next moment I admonish myself, of course it ought to be the same, the brochure has photographs of the peaks. There are no real-estate developers in these mountains to alter the topography of the mountains. And then the big moment, I am now seeing the great Mt Everest, Sagarmatha in Nepali language! The near perfect conical form looms clear in the horizon, flanked by the Lhotse peak to the East and Nuptse to the West. Both these counterpoints to Mt Everest are like flattened plateaus and much shorter than the great Everest itself. There is a thin horizontal cloud slicing through the peaks, but what the hell, I see and I recognize Mt Everest as clear as the day! A lot of white streaked with strands of black. Rising majestically at 8.848 km, the highest point in the Earth’s lithosphere. Nearly at my eye level, just 4-5 km away! I strain my eyes to spot the flag planted on the summit by Hillary/ Norgay duo. And then suddenly I feel so silly! There is a quick invitation from the air hostess to each of us to visit the cockpit and view the peaks from the driver’s seat, as it were. The cockpit window is made of clear material and the view from there is incredibly sublime. Back to my seat, I look down to the gorges below and the trickles of rivers though the gorges. We are now on out return leg. 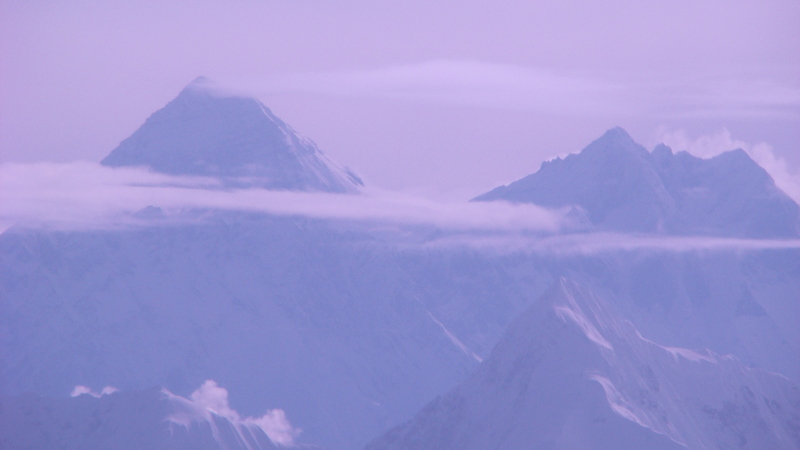 A succession of peaks follow; Cho-oyu, Chugimago, Melungtse and Gaurishankar. And then the descent below the clouds and a smooth touch-down at Kathmandu airport. The air-hostess offers to see us a coffee table book on the Himalayas. “Only 25 dollars each”, she says. Most of us decline the offer, the ticket to the “Mountain” has already cost us around 110 dollars each! Not that she minds as she hands us certificates stating that we had, indeed, taken the “Everest Express” flight, “one of the world’s most exclusive tours”. Grateful for the wonderfully smooth and awe-inspiring flight, we seek a group photo on the tarmac with the Captain. A quick request to the air-hostess and we have Flying Officer Ms Lyngden amongst our midst! The petite lady not only gave us a memorable flight but has an equally memorable smile as well! The photos on my laptop bear testimony!